Walter Charles Dance, OBE is an English actor, screenwriter and director. Dance typically plays assertive bureaucrats or villains. 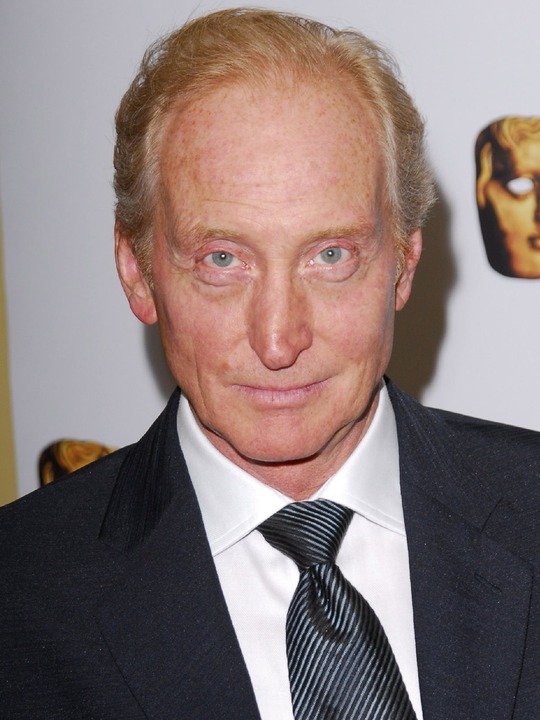 His most famous roles are Guy Perron in The Jewel in the Crown , Dr Clemens, the doctor who becomes Ellen Ripley's confidante, in Alien 3 , the one-eyed hitman Mr. Benedict, one of the main villains in Last Action Hero , and Lord Tywin Lannister in HBO's Game of Thrones . Dance was appointed an Officer of the Order of the British Empire on 17 June 2006. Dance was born in Redditch, Worcestershire, the son of Eleanor (née Perks), a cook, and Walter Dance, an engineer. He attended Widey Technical School for Boys in Manadon. He was set for a career in graphic design after graduating from the Plymouth College of Art before turning to acting. Dance was a member of the Royal Shakespeare Company during the mid- to late-1970s and was in many of their productions in London and Stratford upon Avon. Later he returned to the RSC to take the title role in Coriolanus at Stratford upon Avon and Newcastle in 1989, and at the Barbican Theatre in 1990. He received rave reviews and a Critics' Circle Best Actor award for his performance as the Oxford don C. S. Lewis in William Nicholson's Shadowlands, in the 2007 stage revival. Dance made his screen debut in 1974, but his big break came ten years later when he played the major role of Guy Perron in The Jewel in the Crown , an adaptation of Paul Scott's novels that also made stars of Geraldine James and Art Malik. He has also starred in many other British television dramas such as Murder Rooms, Randall & Hopkirk , Rebecca, The Phantom of the Opera, Fingersmith and Bleak House . He was name-checked in the British comedy series Absolutely Fabulous, as being slated to play the title character in The Life of Jesus Christ 2, which was filming in Morocco at the same time as the main characters of the series were there for a photo shoot. Dance recently appeared as a guest star in the BBC television series Merlin as an infamous witch hunter. He also played Guy Spencer, the pro-Hitler propagandist, in the second instalment of Foyle's War, and had an ongoing role as Dr. Maltravers in the ITV drama Trinity. Dance played Havelock Vetinari in the 2010 Sky adaptation of Terry Pratchett's Going Postal. Dance plays the role of Tywin Lannister in HBO's Game of Thrones, based on the Song of Ice and Fire novels by George R.R. Martin. Dance was wooed for the role by the producers whilst filming Your Highness in Belfast. He has appeared in numerous films, including Plenty with Meryl Streep, The Golden Child with Eddie Murphy, Out on a Limb with Shirley MacLaine, White Mischief with Greta Scacchi , Good Morning, Babylon , Hidden City , Pascali's Island , Alien 3 , Kalkstein , Last Action Hero , China Moon , Kabloonak , Century , Shortcut to Paradise , Space Truckers , Michael Collins , What Rats Won't Do , Don't Go Breaking My Heart Hilary and Jackie , Gosford Park , Dark Blue World , Black and White , Swimming Pool with Charlotte Rampling , Ali G In Da House , Dolls and Woody Allen's Scoop and The Contractor . He recently appeared in Paris Connections as the Russian oligarch Aleksandr Borinski. Dance made one of his earliest big screen appearances in the 1981 James Bond film For Your Eyes Only as evil henchman Claus, and in 1989 he played Bond creator Ian Fleming in Anglia Television's dramatised biography, Goldeneye (the name of Fleming's estate in Jamaica and a title later used for a James Bond film). His debut film as a screenwriter and director was Ladies in Lavender , which starred Dame Judi Dench and Dame Maggie Smith. In 2008, filmed a role in Trinity for ITV2. In 2009, he directed his own adaptation of Alice Thomas Ellis's The Inn at the Edge of the World and made a guest appearance in BBC drama series Merlin as the Witchfinder Aredian and himself in the third series of Jam & Jerusalem. He married Joanna Haythorn in 1970 and they had two children. After his marriage ended in 2004, he had a brief relationship with actress Sophia Myles. He became engaged to sculptor Eleanor Boorman in September 2010. They are expecting their first child together, announced 23 November 2011. Whole or part of the information contained in this card come from the Wikipedia article "Charles Dance", licensed under CC-BY-SA full list of contributors here.